The Morgan letters are a collection of correspondence written by Dr. Nathaniel Alexander “Alex” Morgan to his wife Eugenia Margaret Frances “Fanny” McCown Morgan while he was serving in the Confederate army. The letters begin two days after the Battle of Shiloh on April 9, 1862 and chronicle Dr. Morgan’s journey across the south. The final letter is dated January 29, 1865 and was written as Sherman marched toward Columbia, South Carolina. 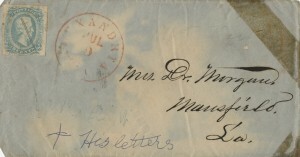 The letters were donated to The Texas Collection at Baylor University by Alex and Fanny Morgan’s descendants, and released serially as an online exhibit during 2012. While the serial release of the Morgan letters is now completed, you can read all of Alex and Fanny’s correspondence by clicking on the chronological listing in the sidebar to your right. Use the menu options above to learn more about the places Alex traveled, the people he mentioned, and to find out what happened after the war was over. The transcriptions presented here have been modified slightly for ease of reading. Words which are indecipherable due to the passage of time or illegible handwriting are noted with brackets. We encourage you to look at digitized images of the original letters which are included in this exhibit. Family photographs may be found in the Gallery.